Another year has gone by and it’s now that time of year again when we’re all getting ready for the new season to kick off. With new brochures going to print, flipping books and websites being updated and Harrogate just around the corner the next few weeks are going to be busy, busy, busy! Harrogate will be held this year Tuesday 17th- Thursday 19th January and our brochure will be distributed to all the Golf Clubs the week after. If for any reason you do not receive your brochure you can request a copy and we will pop one in the post to you. Or if you would like to have a sneak preview, our updated flipping book will be available for you to view online w/c 9th January. 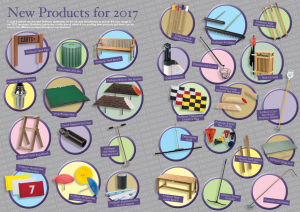 We have been working towards bringing you lots of exciting new products to offer you this year from the TJ and Pattisson Range. TJ Golf will be bringing you their Gold Range of Dew Brushes and Switches. They all come with a gold, anodized aluminium handle and the dew brush comes in two sections so they can be easily transported. We will also be bringing on TJ economy regular flagpins, these will have a UK plastic ferrule and take our new 400 denier tie on flags. Pattisson has a whole teak range from benches to rope stakes, from bins to signage. We will also have some of the old favourites like the Pattisson Screw Fit Rake or if you prefer something from their brand new rakes, we have the Pattisson Pro Rake or the Tour Rake. There is a decent amount of Tee Markers to choose from, whether it be branch, log, teak, dimple or broken tee caddies. You won’t be disappointed with the cups, pins and flags either. Regular flagpins are made from extremely durable fibreglass and are both chip proof and scratch resistant with a PVC sleeve that is shrunk to fit the pin. Comes with Pattisson heavy weight Pro metal ferrule for the tubelock flag system. The tubelock flags will all be 400 denier and very affordable. New from Standard Golf, the Hybrid ST2000 Cup. The popular ST2000 Smart-Fit Cup has a third configuration. A “hybrid”, with an aluminium base and plastic molded walls combines the best of our aluminium and plastic ST2000 models. The aluminium base gives maximum strength as the notched ferrule fits perfectly into place, eliminating twisting, sticking and sinking. Plastic molded cup walls prevent chipping and provide a long-lasting finish. An aluminium bottom allows for the “traditional sound” of a golf ball hitting the bottom of the cup. Hope you all have a great season for 2017 and please do not hesitate to contact us for any enquiries.